These are gardens which are open to the public. Some have a small admission charges. Portland Lan Su Chinese Gardens Admission Charged. One of Portland's greatest treasures-a powerfully inspiring experience that takes you through time, offering a window into Chinese culture, history and way of thinking. North end of Downtown. Portland Japanese Gardens Admission Charged. 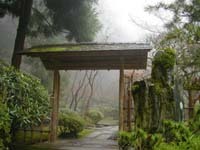 Proclaimed one of the most authentic Japanese gardens outside of Japan, the Portland Japanese Garden is a 5.5-acre haven of tranquil beauty nestled in the scenic west hills of Portland, Oregon. Berry Botanical Garden . Began as the personal collection of a remarkable plantswoman on her estate. Rae Selling Berry (1881-1976)'s garden includes alpine plants, primula and lilies. A rhododendron forest and Douglas fir forest are home to trillium and other Oregon natives. Stroll through the garden to find uncommon treasures. Dunthorpe Neighborhood. 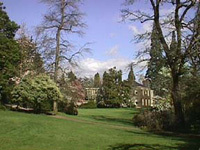 Bishop's Close This private estate turned public garden, consists of thirteen acres on a high bluff on the western bank of the Willamette River. 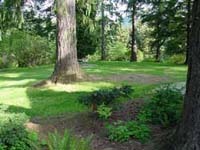 The property includes cultivated English-style gardens, designed by the New York firm of Olmstead and Son, who also designed Central Park in New York City and Lithia Park in Ashland, Oregon. Dunthorpe Neighborhood. The Grotto $1 for Elevator, otherwise free. A stunning 62-acre Catholic shrine and botanical garden. Be sure to take the elevator to the upper garden where there is a truly great view. Northeast on the #12 bus. Sandy Blvd, just East of 82nd Ave.
Portland Public Parks Finder. See also alt search page. The Oregon Gardens Admission Charged.